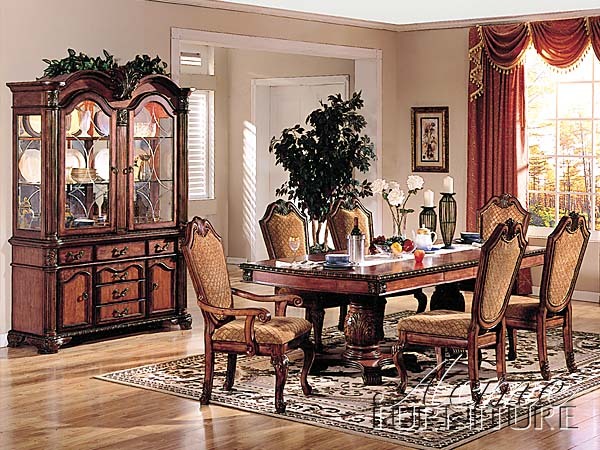 Chateau Collection: $2,699 - Table, 4 Side Chairs, 2 Arm Chairs & China Cabinet!!! The Chateau De Ville traditional dining collection features elegant styling decorative carving and a combination of exotic materials. The double pedestal dining table with over-sized upholstered nail head chairs all accented by decorative base and feet. Matching china & buffet reflects all carefully selected design features of the dining collection. This collection will be the showpiece of your dining room.